Welcome to the Redfish Power UP League and Wall of Fame. Its week 29. This week we have no new graduates. 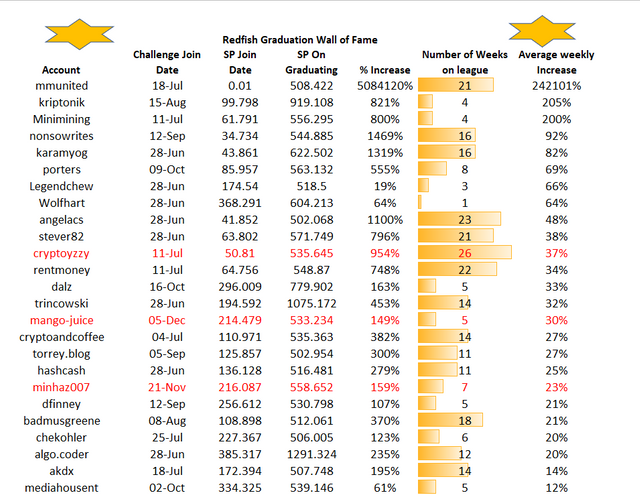 There are now 89 redfish growing with us and tracking their road to minnowhood and also 37 graduates. I wish each and every one of you success in growing your account on Steemit. The aim of this challenge is to grow your own SP to 500. To learn more about this initiative please do have a read of the introduction post . You can join, or leave at any stage, all you have to do is leave a comment below and let me know that you want in or out. This league gives you the perfect opportunity to visit the accounts you would not normally visit. Take a look at the league and visit the profiles of one account above you and one account below and lets show each other a little support. I would like to very much thank @sparkesy43 for doing this the last while. Its really encouraging to see you use this league to support other like minded people. We are all trying to grow our accounts, lets support each other. 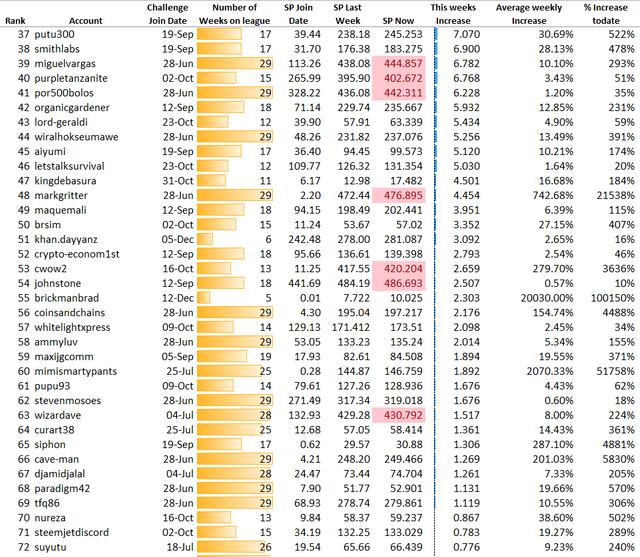 Every Wednesday I will be connecting to the SteemSQL database managed by @arcange and gathering details on the Owned SP for each person in the league.The current weekly owned SP will be compared to the SP held when the person joined the league and the average weekly % SP growth will be calculated. 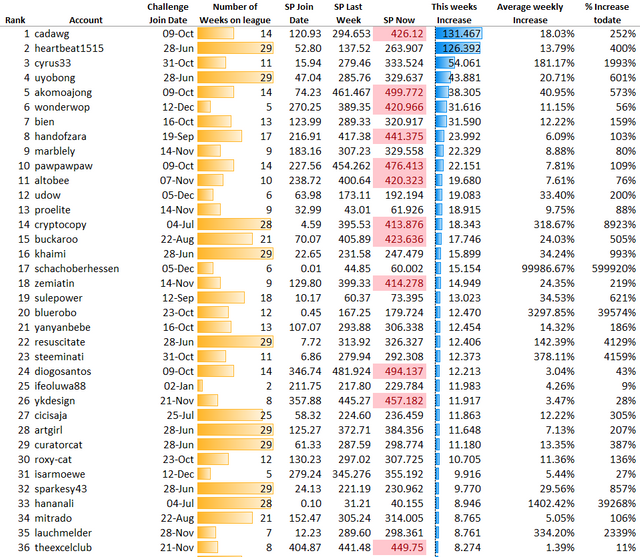 The person with the highest % weekly SP growth will be on top of the league. When a person reaches owned SP of 500, they will be removed from the league and added to the Wall of Fame. Well done @cadawg being first in the league with a massive power up of 131.467sp since the last league post. This puts you first in the league. You will be sent an SBI unit. @heartbeat1515 you are so close in second place I just have to send you a prize too. Congratulations also to @cyrus33, @uyobong, @akomoajong, @wonderwop, @bien @handofzara, @marblely and @pawpawpaw as you were all in the top 10 this week with fantastic growth. Lucky number 15 @buckaroo you will be sent 1 SBI unit. Congratulations. Lucky number 20 @bluerobo you will be sent 1 @SBI unit. Shout out to @cadawg, @akomoajong, @wonderwop , @handofzara @pawpawpaw, @altobee, @cryptocopy, @buckaroo, @zemiatin, @diogosantos, @ykdesign, @theexcelclub, @miguelvargas, @purpletanzanite, @por500bolos, @markgritter, @cwow2, @johnstone, @wizardave. You are all on the home stretch. Wont be long now before you are minnows. Keep going everyone. For the last two months we have had sponsorship from @curie. A big shout out and thank you for the support. We have also now just secured funding for another 8 weeks. A second massive thank you! I would also like to thank @simplymike and @bengy for their previous support. Thanks for the mention. I know my dusty little vote really isn't worth much (yet), but we all have the same goal. We're all powering up and increasing our stake in Steem and every little bit helps. I figure if I can support two fellow league members each week (the ones directly above and below me on the list), then we can all win in the long run. I can't claim the credit for the idea. I saw it elsewhere and thought it would be good to do here. Thank you for the SBI. Usually I have been hovering around rank 30. Hopefully I can hang around position 20 a little longer. I didn't expect I went that high. This make me really happy. Thank you all. I expected to see more first timers on the board given the recent increase in sign ups but I guees they have been slow to start. I will try to send some over as I curate some introduction posts this week. Thanks for the continued effort! Oh you made me Power up real fast.. Suddenly the idea of having liquid steem dnt matter anymore, i powered it all Up. Thank you for keeping Steemit fun! Your UA account score is currently 7.019 which ranks you at #89 across all Steem accounts. Your rank has improved 1 places in the last three days (old rank 90). In our last Algorithmic Curation Round, consisting of 356 contributions, your post is ranked at #59. Good idea - please take me in. Congratulations to the winners. I muat make it to the top list next week. This is an awesome projects to help a lot of redfish, thanks for doing this league.